Home › Blog › Latest Digital Episodes of A Deviant Mind Available Now! Latest Digital Episodes of A Deviant Mind Available Now! Episodes 35, 36 and 37 have been added for download at our Members Only area! It's been some crazy times in the RimWorlds lately, and since these next five episodes are part of A Deviant Mind, Volume 8: End Game! we can only guess it's going to get even more interesting. A Deviant Mind #37 is off to print and we'll announce the On Sale Now date as soon as it becomes available. Or keep your eyes on Sword and Labrys Productions' website, because it goes on sale first there and at IndyPlanet. Deviant Members can head over to Members Only and grab their episodes now! Take A Deviant Mind with you everywhere you go! Want to read more of A Deviant Mind but not a subscribing member yet? Consider a TRIAL offer! For just 99¢ you can grab THREE episodes of A Deviant Mind in digital download, plus have full access to the rest of the webcomic series for the duration of your trial. Or grab the Saturday Matinee! All you have to do to claim your FREE downloads is to go to the All-New Members Only page, where you can skim the awesome Members Only Access slideshow and download the episodes you want. Why not grab a Bronze Level Trial Subscription now? Read the whole series once you're activated, and decide whether you want to join the legion of fans who make this series great. Make your selection below. 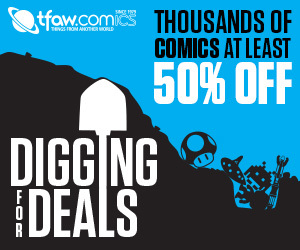 $.50 for two day FULL COMIC access, non-recurring. No commitment! For pledging 99 cents per month you'll have full site access to Members Only Content, free monthly wallpapers for your desktop, mobile phone, and tablet, along with each and every FULL episode of A Deviant Mind! Remember, if you want more, all you have to do is upgrade your VIP Membership! Three FREE episodes of A Deviant Mind of your choice located on your Silver Member Landing Page.